We have three cats, all are black! Did we ask for three black cats….nope. For the first two, Oreo and Jasper, we just asked for the runt of the litter. We adopted Edgar recently and let me tell ya, I (okay, my entire family) LOVES that Edgar decided to come live with us, he is such a freaking ROCKING cat! 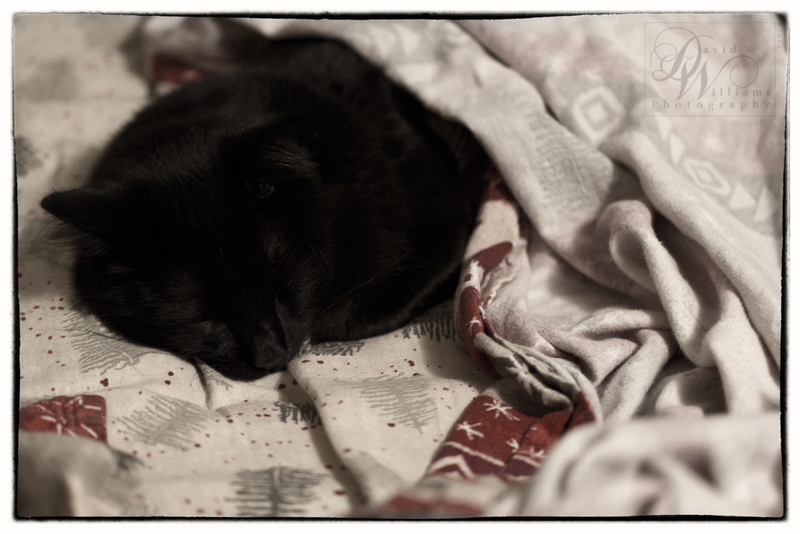 I took this shot early Tuesday morning (around 5:15am) partially to test out the high ISO but more importantly, because Edgar let me drape the sheets over him and then he proceeded to fall back to sleep! When I talked to Amy later that morning, she said he was still under the sheet at 7:30! Now you have to admit, my cat (yes, my cat) just ROCKS! I am a cat lover as well.. this is precious! I have a blackie, too. In fact, my life has been a series of black cats, and all were strays that showed up except for the current. She was the runt from a litter at the pound, a litter of all black cats. For the photo, I’m impressed as from my experience, it is really difficult to photo black cats. That camera really rocks the ISO, doesn’t it. Adorable, nice life Edgar has. Lovely cat, and oh so black that I had to tilt my screen just right to see his face. My cat likes the bed too – she boots me out of bed at 7:30am pretty regularily – she stands on the floor at the foot of the bed and miaows in a loud voice. Once I am out, she gets in (usually insisting on our help), under the warm covers by where my feet had been and there she stays until about 1 or 2pm. Most days, even if the wood stove is lit. I don’t always want to get up at 7:30, but not a lot of choice. She is in charge after all. I’ve been buggin’ you for this for a while! Lovely kitten, miss the little bugger. Thanks for taking a picture of the dude! !